Nothing about Bikram’s Beginning Yoga Class™ is haphazard. It is a twenty-six asana series designed to scientifically warm and stretch muscles, ligaments and tendons in the order in which they should be stretched. Bikram’s twenty-six exercises systematically move fresh, oxygenated blood to one hundred percent of your body, to each organ and fiber, restoring all systems to healthy working order, just as Nature intended. Proper weight, muscle tone, vibrant good health, and a sense of well-being will automatically follow. How quickly you progress will depend entirely on you. It will have to do with how well you understand what you are trying to accomplish in each pose, how honestly you try to accomplish your goal, and how supple your muscles and joints have become in comparison to the point at which you began. In Yoga there is no standard of comparison except yourself. Perfect is the best you can do that day. If practiced regularly, Bikram’s yoga will reduce many symptoms of chronic illness and unite the mind, body and spirit. Benefits include: increased flexibility, strength and balance, weight loss, defined muscle tone, improved energy, and a slowed aging process. 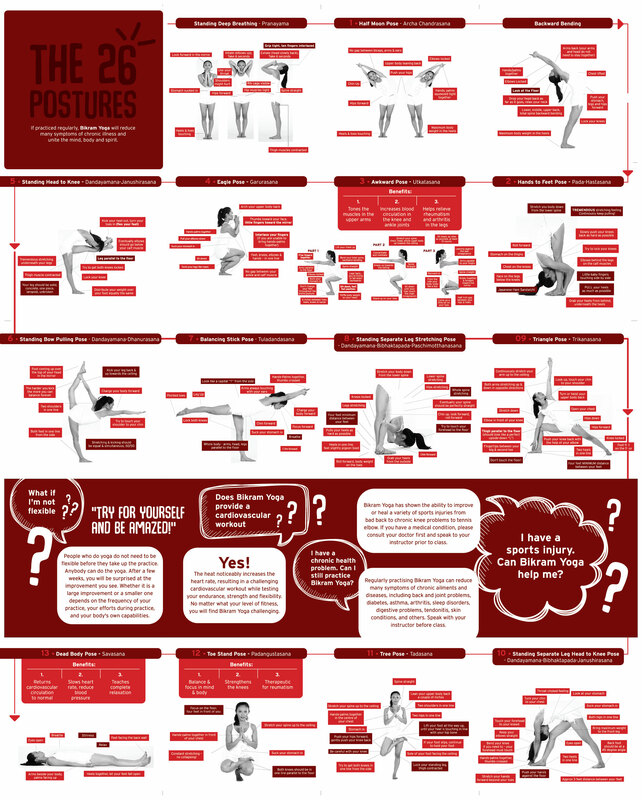 In summary, Bikram’s yoga is an excellent all-around practice to enjoy for the rest of your life. Improves overall body strength, Strengthens and tones leg muscles, Improves flexibility in toes and ankles, Aligns skeletal system. Detoxifies and cleanses body by removing stale air and toxins from lungs, Strengthens abdominal organs and wall, Good for high blood pressure.